You are sure to enjoy your stay here at Boone, we have all the amenities you could need, and you can enjoy them under a shady tree! We are sure you won't want to leave. All located in the heart of Central Texas! Located in the beautiful countryside of the Texas Hill Country, Boone RV Park in Lampasas, Texas is the perfect getaway for the traveling family or Winter Texans! 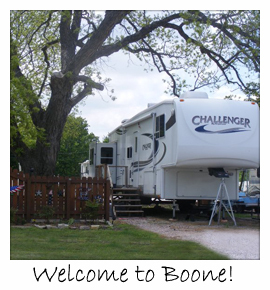 Boone RV Park is pretty as a picture with Burr Oak and Pecan trees offering shade and the colors of wildflowers in a peaceful, country setting. You'll find an abundance of Texas hospitality and welcoming smiles when you arrive. Your hosts, Carolyn and Charlie Brown, are fine folks and will make sure your stay is pleasant and comfortable. 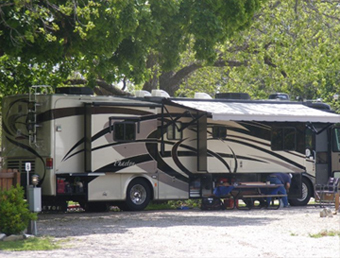 So, whether you're looking for the perfect relaxation spot in the Texas Hill Country, or you want to enjoy the sights and recreational activities the area has to offer, you'll be pleased that you chose Boone RV Park. After you settle in to your new "home away from home," you can relax in the cool shade and escape the Texas sun or enjoy a picnic. Just across the highway is Hancock Park, a beautiful city park with everything you need to have some family fun. Bring your golf clubs and practice your swing at the park's 18-hole golf course. There are also playgrounds for the "little explorers," a swimming pool, and great fishing on Sulphur Creek. Boone RV Park also offers fellowship with friends, old and new, at campin' cookouts and potluck suppers. Lampasas and its surrounding area has much to offer to visitors. The numerous springs, creeks, and rivers offer relaxation and recreation including swimming and fishing. The downtown area features a historic Courthouse Square, including Saturday tours of the Historic Courthouse. There are many restored buildings, specialty shops, galleries, and a variety of restaurants including ethnic foods, country cooking, and barbecue. Self -guided Tours of our Unique Sculpture Gardens at Campbell Park and the Beautiful Murals all around town. Also you wil find several wineries, several lakes, and charming tourist towns nearby. Lampasas has something for everyone. Fort Hood is just a short 25 minute drive from the park, we would love to host family and friends of those in the military. October - Herb & Art & Lampasas Wine Tour, Squared Silly for the kiddos. December - Carol of Lights, Christmas on the Creek, Tour of Homes and A Lighted Christmas Parade with the crowning of the Snow Queen.